22 Immediately [after feeding the 5,000 men] Jesus made the disciples get into the boat and go on ahead of him to the other side [of the Sea of Galilee *1], while he dismissed the crowd. 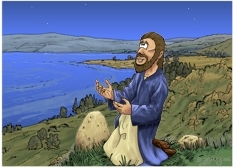 23 After he had dismissed them, he went up on a mountainside by himself to pray. When evening came, he was there alone, 25 but the boat [with the disciples] was already a considerable distance  from land, buffeted by the waves because the wind was against it. Verse 23 tells us “when evening came”. This scene is set at night time. This scene is at night. There are a few stars providing blue/white light in the scene. In the second version there is an additional beam of light coming from the Father in heaven which illuminates Jesus in that scene. Jesus, kneeling on grass, praying to God the father in heaven. This is actually the last scene I have drawn for this set of Bible Cartoons. I used photographic reference for the rocks & plants of the lake shore. Here’s the scene without the figure. *1 The Sea of Galilee is also called Lake Kinneret, Lake Gennesaret, the Sea of Tiberias or Tiberias Lake. (Source: World Lake Database, International Lake Environment Committee Foundation (ILECF)). 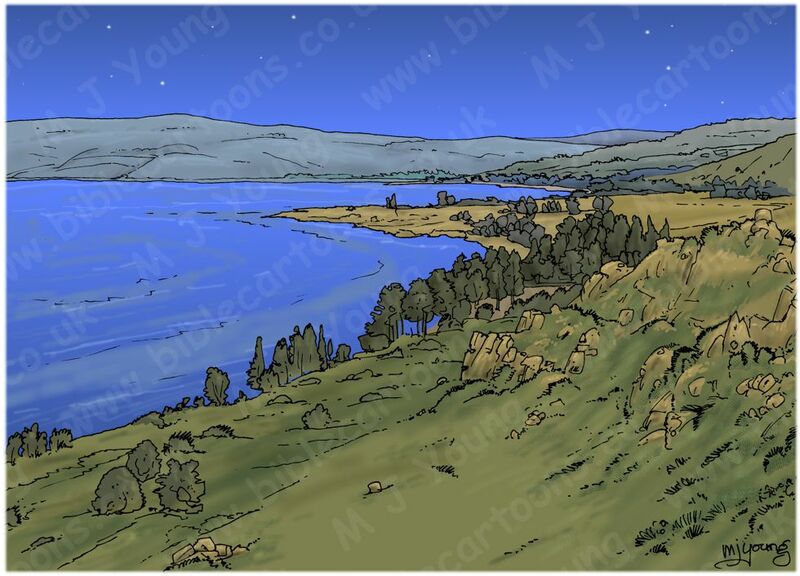 The Sea of Galilee is the lowest freshwater lake on earth at approximately 700 ft (210 metres) below sea level.